Healthcare data security is due for a long-needed update. With patients receiving the wrong brain surgery and hospitals’ data infrastructures being hacked globally, this sector is in need of a serious technological update. Highly sensitive information such as patient lab records or patient vitals data can be compromised by data breaches. These data security issues plague healthcare providers, health insurance companies, and patients. Blockchain technology can act as a secure reservoir for all healthcare data that feeds all the participants of the healthcare system. The blockchain can secure patients’ lab records, biometrics, insurance claims, and fitness data. Everything has gotten increasingly connected – but can we deal with the demand and security risks? Hospital devices are becoming increasingly more connected. Pacemakers, defibrillators, and other medical units that keep patients alive are able to connect via Bluetooth, where they are controlled via remote controls. It is estimated that the average hospital bed has around 10-15 connected devices. Data from medical devices also are sent to outdated, centralized servers, most of which are easily exploitable. It is imperative that these devices and servers are secure in communication. In fact, in the last year, there have been a series of global attacks made on hospitals around the world. This virus, a type called ransomware (similar to the WannaCry virus), demanded a ransom in Bitcoin in order to decrypt the hospital’s files. These files included information such as patient records, the hospital’s messaging systems, monitoring systems, and more. This can prove detrimental to the patients in the hospital, as the doctors and nurses within various departments will suffer from communication issues. Patient identification will also be more difficult when the infrastructure is down, and is not something you want to mix up when two patients with different surgical procedures. Most hospital patient records are kept centralized and under the traditional tech, that without fail, have been breached in multiple ways over the last few years. This an lead to identify theft, as sensitive patient data can also be lost/stolen. Between the healthcare provider, health insurance, and any investigators, data needs to be stored and verified reliably, quickly and securely. It also needs to be quick to access for all associated parties. As stated above, blockchain is simply a convenient way to solve the above issues. It provides the necessary functions that are needed to secure and audit healthcare data, send payments, communicate with other health providers’ blockchains, and a whole lot more all in one setup. It is also immutable, a key factor when maintaining the data’s chain of custody. This immutability can serve well when investigating insurance claims or malpractice investigation. The end-to-end tracking of data makes it very easy to pinpoint issues or get a birds-eye view of each patient’s scenario. For this article, we will be using NEM as the blockchain of choice (specifically Catapult). 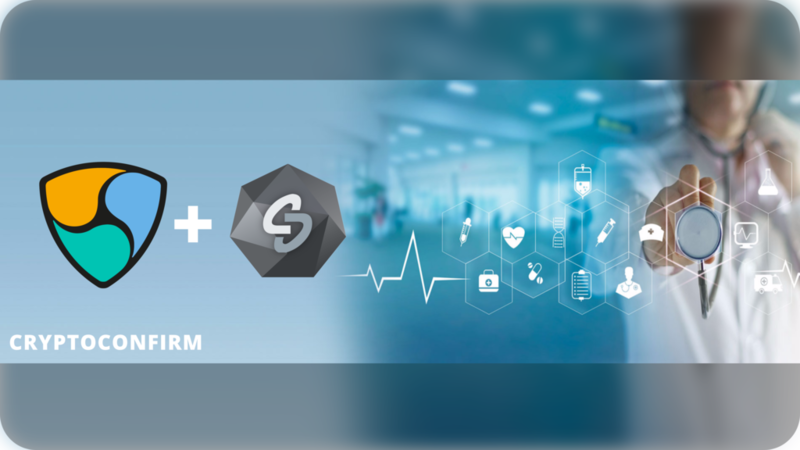 Its smart asset system, multi-signature contracts (a transaction requiring cosignatories), Apostille system, and cross-chain transfers (transfer data between two separate blockchains) make it an appealing technological solution for healthcare. In the solution portion of this article, I will go more in depth on how these NEM features can play a big role in the solution to the healthcare infrastructure. With NEM, hospitals and health insurance companies can communicate easily to each other in a secure way. Insurance companies can keep track and have access to an immutable record of healthcare procedures. This can save the insurance companies a lot of time and money in claims. This tracking can be achieved by a NEM multi-signature contract could be used to hold all parties responsible and verify that that the information in the claim is true and accurate. Only those needed to be involved with the case can be given access rights via NEM multisignature. NEM’s smart asset system (often called mosaics) makes it incredibly easy to create assets that can represent the stock/quantity of an item in an immutable way, such as the number of highly regulated pain medication available. Each bottle could be outfitted with an NFC/RFID tag that is scanned once it is in use. This same concept can apply to any expendable resource in the hospital. The NEM Apostille system could also be used to store the hash of patient files such as the letter of medical necessity (LMN). If anything went wrong during a procedure, the hash of that file can be compared to what the patient was given to ensure to was correct. This can also be check pre-operation to prevent any mix-ups. The patient’s biometric can also be hashed and later verified on the operating table to avoid any receiving the wrong surgery. The use of private blockchains networks may also work well here in conjunction with Catapult secure lock transactions (cross-chain transfers) to transfer data between two different blockchains. An example of this could be Hospital A needs to get a patient’s record from Hospital B. A transfer, with the patients permission via entering their private key or biometric, could occur from Hospital B’s network to Hospital A’s. If a patient passes away in a hospital due to a potential malpractice, investigators will have the blockchain’s immutable record of what happened to the patient. Did the patient receive the right medicine? Were the proper procedures carried out? Was a piece of equipment malfunctioning and crossing the threshold? Did the hospital neglect the patient? All of these questions can now be easily answered because of the end-to-end tracking process that blockchain provides. Rather than have ten health monitoring devices logging data to a central server, they can instead log this information directly to a Catapult side-chain. The disruptive technology of the direct transfer of data from embedded devices to blockchain, is proprietary to CryptoConfirm. The use of IoT devices and smartwatches can also communicate directly to the blockchain under the patient’s profile. This data, such as movement, food consumption, and other fitness data will enable the health insurance company to read and provide discounts for a proven healthy lifestyle. The data from the hospital bedside is encryptable. In the event that one or more IoT devices can’t connect, the encrypted data is stored offline to be uploaded when the connection is available. This is to ensure that absolutely no data has been lost during any scenario where there is no connection to the blockchain. Each suite of connected devices surrounding the hospital beds can also cosign the NEM transactions to ensure a full packet of data has been properly recorded. If successful, this will signal that the devices are all operating normally under the correct thresholds, and if not, will alert hospital staff to potential issues with the equipment. Coupling an immutable, secure, distributed data structure with small embedded devices creates an interesting dynamic of live, unadulterated data being stored on the blockchain. Many lives depend on the hospital having a good data infrastructure. Embedded, IoT devices can serve as a powerful tool in making the best medical decisions for a patient. This information can be logged on the blockchain to provide a deep, secure medical history of the patient’s stay in the hospital. This article’s goal was to introduce the disruptive ways NEM can be utilized in the healthcare industry. I hope you enjoyed this article. Feel free to leave any comments and tell me what you think! If you want to chat with me privately, you can contact me on Telegram: @crackingcode.